The Buena Vista model has 2 Beds and 2 Baths. 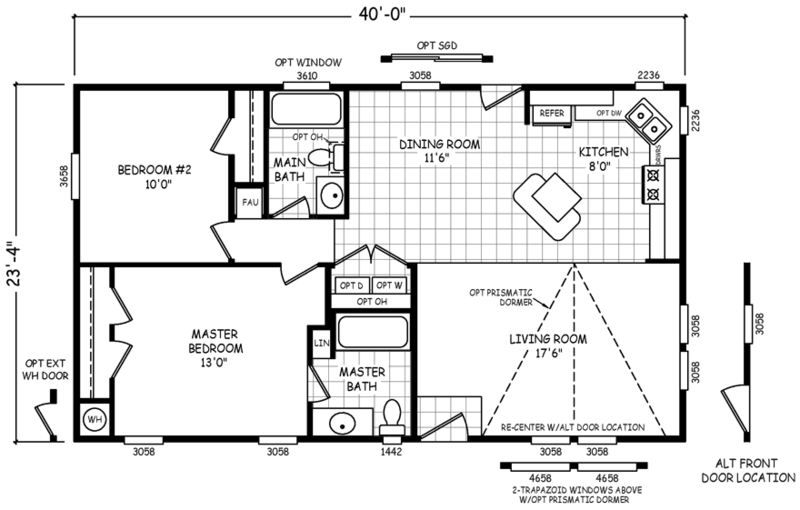 This 933 square foot Double Wide home is available for delivery in Arizona, California, Nevada, New Mexico, Colorado, Utah. Average in size but by no means average in its appointments, the Buena Vista model is designed for the archetypal family unit. It’s affordably priced yet includes all the most popular ‘must-haves’, like an open layout perfect for gatherings, a modern kitchen with island dinette, two bathrooms, walk-in closets, 31” hardwood overhead cabinets and a bevy of sophisticated options to choose from. If pictures are shown, they may depict upgrades and options that are not included within the base price of the home. Ask your housing consultant for details about the other great features that come standard on the Buena Vista manufactured home.